In a mysterious lock up in south London two sons divvy up the emotional legacy of their estranged father. An unsettling tale of brothers, bloodties, nationhood, and a dead London cabby, that plays out like a taut thriller. 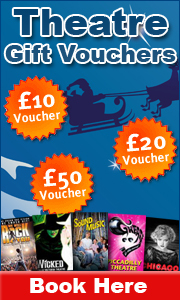 We have launched a new website dedicated to Shrek Theatre Tickets. This new stage musical is based on the story and characters from the Oscar-winning DreamWorks Animation film Shrek, the first chapter in the much loved series of irreverent fairy tales. We have a new theatre and dinner package combining an Upper Circle ticket for Hair the musical and a two course meal at Kitchen Italia. The new site is a more traditional “find theatre tickets by show” type of site but in the same style as Theatre Box Office. What we have done on the new website is made all of the information about a show and the theatre it is playing at available on one page. The new website is London Theatre Tickets (londontheatretickets.org.uk). The first part of our “MAY SPECTACULAR” sale is officially open as of today! This first wave of offers is based around our great dinner & show, hotel & show and for Mamma Mia and 39 Steps our NEW Dinner, Show and Q&A session with the cast. A full list of the featured new offers can be found below. We now have pre-theatre and post-theatre ticket and dinner packages for The Fantasticks and Thai Square. The Fantasticks tells an allegorical story, loosely based on the play The Romancers (Les Romanesques) by Edmond Rostand, concerning two neighboring fathers who put up a wall between their houses to ensure that their children fall in love, because they know children always do what their parents forbid. Thai Square location in the heart of London on The Strand, close to Covent Garden and Charing Cross Station, makes it ideal for theatre-goers and Thai food lovers. The packages are available for Monday to Saturday performances at 7.45pm and the restaurant will be booked for 6pm or 10.30pm.